The subtitle of this encyclopedic and much-needed—if sometimes rambling and repetitive—book says it all. Anti-Semitism, the "longest hatred," is indeed, as described by one of its best-known historians, Robert Wistrich, a specific phenomenon different from other forms of racism and xenophobia. It is the only form of prejudice where the targeted group can be perceived as both preternaturally clever and ineffably clueless, impossibly strong and preposterously weak—all at the same time. But not everyone agrees that it is indeed "a specific phenomenon." In fact, after World War II, the preponderance of both scholarship and political thinking about anti-Semitism—including in the Jewish intellectual establishment of the United States and Europe, as expressed by Theodor W. Adorno, Max Horkheimer, and Stephen S. Wise—held it to be a form of racism like any other, no different from that against blacks, Hispanics, Asians, or Native Americans. Heni's book is the first full-length work to argue against that misguided consensus. He deserves great praise for it. "Anti-Semitism means hatred of Jews as well as the Jewish state of Israel, and it means the distortion of the Holocaust," Heni declares, a view which dovetails closely with his critique of the banalization of the Holocaust as merely a product of modernity, maintained by Martin Heidegger, perhaps the twentieth century's most influential philosopher. As part of this ever-expanding legacy, new "blood libels" find expression in conspiracy myths such as the claim that the terror attacks of 9/11 were an inside job perpetrated by Jews. Tragically, much of the Left, like the Islamists with whom it is often allied, sees the Jewish State as peopled not by human beings but rather by some sort of bacillus, or a unique race of demons—deserving of special treatment. Of course, they are not the first to make that argument. 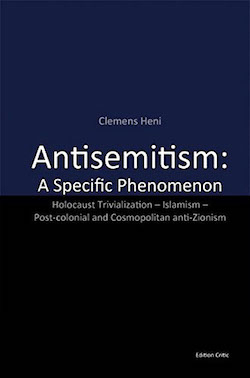 To illustrate anti-Semitism's uniqueness among the many forms of ethnic and religious hatred, Heni argues that it is not only the oldest—making Jews the target of everyone from Greco-Roman-era Egyptians to Christians, Muslims, and neo-pagans (like the Nazis)—but also the only one to produce anything like the Holocaust. "Even horrible regimes, which killed political or other enemies in their own countries did not aim at a specific group of people [for complete extermination] everywhere they could find them," Heni notes. In political activism and academe, anti-Semitism is increasingly widespread but typically denied by those who have embraced it. Heni takes particular aim at the often-intertwined worlds of political activism and academe, in which anti-Semitism is increasingly widespread but typically denied by those who have embraced it. This is seen most clearly in the postcolonial and cosmopolitan schools of thought that dominate today's universities. Postcolonial theorists and writers, such as Edward Said and Judith Butler, pigeonhole Israel as simply a colonial-settler state, guilty of imposing European values and populations onto the natives of Palestine. By doing so, they purposely ignore both ancient and modern history—disregarding the fact that the Jews waged struggles against the great colonizing powers of their day—Babylon in 605 B.C.E., Rome in 66-70 and 132-136 C.E., as well as Great Britain in the 1930s-40s. A shibboleth of the Left is that there is a difference between opposing Zionism and anti-Semitism. While such a view is often a convenient excuse for Jew-haters, it is refuted, Heni shows, by the obvious double-standard applied to the behavior of Israel compared to any other nation on earth. The howls of outrage expressed over the deaths of relatively small numbers of Palestinians killed in conflict with the Israelis is in sharp contrast with Leftist and Muslim silence over the massive number of mortalities of Kurds and Shiites under Saddam Hussein, of Christians and animists in Sudan by Hassan Turabi and Omar Bashir, or of the hundreds of thousands of Syrians gassed and barrel-bombed by the Bashar al-Assad regime. This peculiar double-standard is another key element that renders anti-Semitism a distinct phenomenon. Heni singles out one nation's special character and history for its contribution to the rise of modern anti-Semitism and its metastasis today: Germany. It was there that journalist/agitator Wilhelm Marr coined the term anti-Semitismus in 1879 to mean the hatred of Jews as a race, labeling them beyond assimilation and calling for their murder and banishment. Heni identifies current Islamist anti-Semitism as another legacy of "German, Nazi-style Jew-hatred," imported and melded with traditional Islamic anti-Jewish bias. Indeed, the Nazis disseminated a massive amount of anti-Semitic propaganda in the Middle East, amplified by the active collaboration of the leader of the Palestinian national movement, Hajj Amin Husseini. Both The Protocols of the Elders of Zion and Hitler's Mein Kampf, translations of which were promoted by Husseini, have been bestsellers throughout the Arab and Muslim worlds. The latent traditional distrust and disdain for Jews in Islamic culture has largely turned into outright hostility with grotesque caricatures of bloodthirsty Jews murdering hapless Palestinians and calls for the Arabs to finish Hitler's work in killing them. The circle is complete when news sources in Sweden claim that Israelis harvest organs from Palestinians they have killed, or when that country's foreign minister blames Israel for attacks against Jews in Paris. Still, there are pockets of hope. Heni could well see as a major victory a March 2016 vote by the University of California's board of regents to define anti-Zionism as a form of anti-Semitism. The fact that such a vote was even necessary, however, indicates the extent of the problem, one that has exploded on campuses and in the media. More than seventy years after the liberation of Auschwitz, anti-Semitism remains the source of genocidal dreams for a variety of global movements—including some, notably Islamism, that are spreading like a genuine, not imaginary, affliction. Raymond Stock, a Shillman-Ginsburg Writing Fellow at the Middle East Forum and instructor of Arabic at Louisiana State University, is at work on a biography of Naguib Mahfouz, many of whose works he has translated. Related Topics: Academia, Antisemitism | Raymond Stock | Spring 2017 MEQ receive the latest by email: subscribe to the free mef mailing list This text may be reposted or forwarded so long as it is presented as an integral whole with complete and accurate information provided about its author, date, place of publication, and original URL.